Mental health seems to be a topic of conversation now more than ever. Campaigns spearheaded by the royal family, as well as public discussions sparked by influencers, celebrities and everyday people all show signs that it’s increasingly acceptable to discuss mental health (not to mention the launch of a certain magazine dedicated to mental health, of course). And why shouldn’t it be acceptable? Time to Talk Day is a great opportunity for all of us to talk about mental health – even if you haven’t struggled with mental health issues of your own, or know anyone who has – whether that be a conversation with a friend, or checking in on a family member you haven’t spoken to in awhile. Counselling Directory supports making the conversation on mental health the same as talking about our physical health – all a normal part of everyday life. Our analysis shows that the increase in awareness of mental health issues appears to be resulting in an increased demand for counselling services too. “The fact that we have seen such a significant increase in enquiries to professionals on our website shows that people are increasingly open to using our directory to seek talking therapies to improve their mental health and wellbeing,” a Counselling Directory spokesperson said. 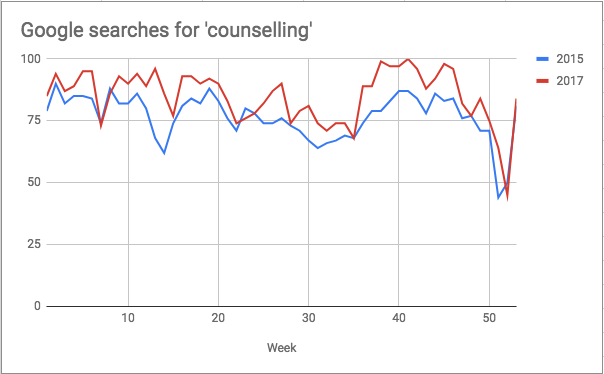 Statistics pulled from a Google Trend report support this increase – data show an increase of about 11% in search demand for the term “counsellor” in 2017, compared to 2015. Talking enables a person to share what is on their mind and what may be causing them worry or distress and it is the first step to improving their mental health. “We all have blind spots, especially about ourselves, and talking with someone may lead to them helping you identify patterns of behaviour that may have been mysterious to you, and may also be destructive to yourself or your relationships with others. Saying things out loud to another person can feel like a tremendous relief, and feels completely different from the thoughts going around in your head” Counselling Directory member Teresa Mulvena, CBT Cert, MA Counselling, MBACP (senior accredited) said. Although there has been improvement, we still have a long way to go when it comes to mental health, but we’re happy to do what it takes: Let’s keep talking.